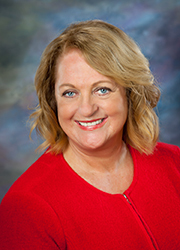 Prior to coming to Lamar University, Dr. Derina Holtzhausen was director of the School of Media and Strategic Communication at Oklahoma State University. She joined the faculty of OSU in 2008, and served there as professor and director for the SMSC. With a quarter century of experience as a journalist and strategic communications executive in the complex South African environment, Dr. Holtzhausen is a strong proponent of the role communication, media and the arts play in society to promote social justice and discussions on diversity and equality. Under her leadership, enrollment in the school grew 25 percent to around 790 students on its Stillwater and Tulsa campuses. Student diversity in the school increased under her watch from 15.4 percent in 2008 to 25.6 percent students on its Stillwater and Tulsa campuses. Prior to joining OSU, Dr. Holtzhausen was an associate professor, head of public relations sequence, and graduate director of the School of Mass Communications at University of South Florida, 1997-2008. Prior to her academic career, she served as head of corporate communication for the South Africa Tourism Board, 1992-1995, and an executive consultant for ABSA Bank, Johannesburg, South Africa, 1995-1997. An active researcher, her published research includes two books, 23 peer reviewed articles, seven book chapters, and 46 panel and paper presentations. She has been the recipient of numerous grants, awards and scholarships. She has served as founding editor for the International Journal of Strategic Communication, 2007-2012, and consulting editor, International Journal of Strategic Communication, since 2012. Dr. Holtzhausen was selected as one of Oklahoma’s Top 20 Women Professors for 2013 by Online Oklahoma Schools, was named a Fellow of the Scripps Howard Journalism Entrepreneurship Institute in 2012, and received a 2012 PRIDE Book Award from the National Communication Association for outstanding contribution to public relations theory for her book Public Relations as Activism: Postmodern Approaches to Theory and Practice.